She was a beauty and a star! She won a most coveted title from The American Hanoverian Society – the MPT, Mare Performance Test Benchmark. The Mare Performance Test evaluates a mare’s rideability, gaits and jumping talent, with each area weighted one-third in the final score. The Benchmark award is presented to the mare(s) that achieve the highest combined score on the jumping part of the MPT. Penelope was talented! She also, at one time, had a foal – a foal that became a lovely dressage horse. Sadly, Penelope had fallen on hard times and, despite her previous owner’s best efforts, she could not keep any weight on Penelope. 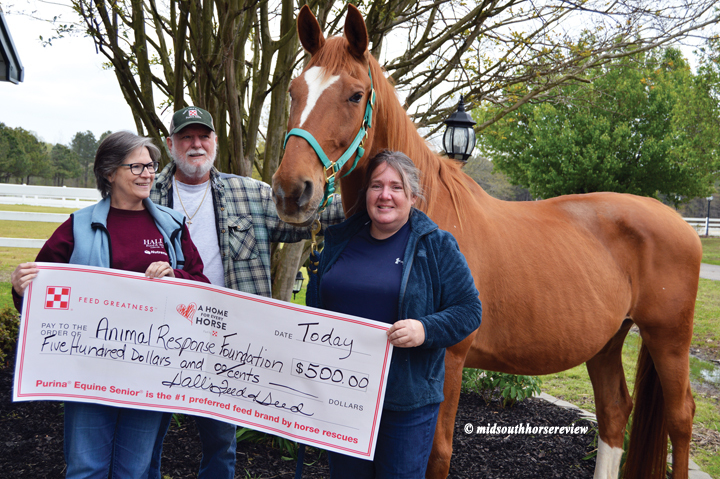 So the owner made the difficult decision to surrender Penelope to Animal Response Foundation, Inc., (ARF) an organization that specializes in rehabilitating horses who, for whatever reason, are in dire straits. Rehabilitating a starved horse is no easy task. But Dr. Dunlap has derived a formula that works well to bring these horses back to health: a combination of Purina® Equine Senior®, Alfalfa cubes, and Orchard Grass hay. But the formula isn’t cheap. A bag of Equine Senior® can cost $20-$22 a bag. And it can cost up to $2500 or more per horse to bring that horse back to health. In addition,if a horse presents as the “dreaded downer,” i.e., a horse who is too weak and/or starved to stand, this horse requires additional specialized care: technical large animal rescue experience and long term intensive care to get the horse on the road to recovery. Fortunately, there are generous people willing to help these at risk horses. Last winter, Purina ran a month-long campaign to donate $1.00 for every bag of Purina® Equine Senior® sold to a horse rescue organization. “This was the first year we’ve done this sort of campaign,” said Kiley Heckman, integrated marketing communications manager for Land O’Lakes Purina. Participating in the program, Hall’s Feed and Seed in Collierville, Tenn. got to keep 50¢ from each bag sold to donate to a rescue organization of their choice. Purina donated the other 50¢ per bag sold to the rescue organization it supports: A Home for Every Horse. Purina® claims that its Equine Senior® horse feed is the No. 1 preferred feed brand by horse rescues. Dr. Dunlap agrees: “It’s the go-to feed. It’s a life saver – that and soaked Alfalfa cubes.” Purina Equine Senior® is also the go-to feed for ARF. People have been buying feed for ARF through Hall’s Feed and Seed. When a donation is made, ARF will send a receipt to the donor. (1) The horse is old, or injured and the owner can’t afford treatment, or the owner has lost interest in the horse, or the horse has outlived its usefulness to the owner. (2) A change in the owner’s circumstances, e.g., employment status, ability to afford a horse, illness, incapacity to care for the horse. (3) The horse has come to be owned by an animal abuser. Dr. Dunlap says there are people who hoard animals, who are just concerned with collecting them, but do not (or cannot) properly care for the animals they collect. They are not concerned with the welfare of their horde of animals. Fortunately for the horses, there are organizations like ARF who remove these abused/neglected horses from such distressed situations and provide them with a responsible home where they get proper care. Currently, ARF has 14 horses they have rescued and are rehabilitating. One of ARF’s recent rescues, Henry, is in an Anderson sling. Dr. Dunlap says some horses are so weak from starvation they might have to be in the sling for a month. Henry was almost starved to death, and when they found him, he was down and too weak to get up. So they put him on the tarp/sled to bring him to the specially equipped stalls, where now he is slowly recovering – on soaked Purina® Equine Senior®, of course. ARF mainly receives horses from animal cruelty cases in the 25th Judicial District, plus Shelby County. The 25th Judicial District Circuit Court covers Fayette, Hardeman, Lauderdale, McNairy and Tipton counties. ARF only goes into situations to rescue horses when requested bylaw enforcement. Once the rescued horses are rehabilitated enough, they may go into training, getting readied for adoptive homes. But ARFwants to assure that these horses get and keep a proper home. 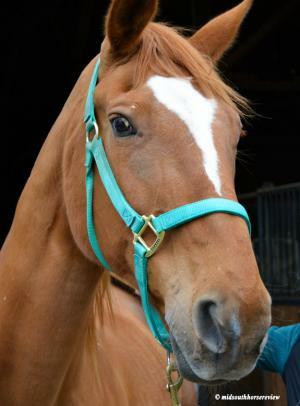 Dr. Dunlap states, “ARF is always looking for the right home for these rescued horses. ARF builds in a safety net so that if for some reason the adopter cannot properly care for the horse, the horse can come back to ARF. ARF wants to make sure that the horrors in their lives are over!” As one part of that safety net, every rescued horse is microchipped. Dr. Dunlap encourages people to consider becoming a foster home for these rescued horses. It’s a very rewarding experience to see the horses, once again, bloom and thrive in a safe and loving environment. Find out more about ARF on facebook at Animal Response Foundation and their new website, animalresponse.org. You can view Henry’s rescue on facebook and donate to ARF via PayPal on the donate page of their website.